Teaching boys to be successful, responsible husbands and fathers begins when they are young. Teach them to respect women and to be self sufficient, helpful, and to share responsibilities in their future relationships. This is a guide about raising boys to become responsible husbands and fathers. I once heard it said that you will never really know how effective you were as a parent until your child grows up and has a family of their own. Teaching a young boy responsibility and good values make life not only easier for the parent, but for his wife and family later in life. Excusing bad behavior by explaining,"OH, HE'S JUST A BOY!" doesn't really cut it in the real world - outside of the home. Unfortunately the world doesn't love us the way a Mom does. A boy's respect for women begins at home. Allowing a boy to hit or mistreat a female sibling gives out the message that females are unworthy of their respect. Unless it's taught at home, some poor woman will fall victim to his wrath. Teaching a son that no one else is responsible for his upkeep makes life easier on both a Mother and a future Daughter-in-law. You know the old "House Rule", if you make the mess, clean it up! It begins early with Toys, clothes and snacks. Good habits formed early will follow them through their adult life. 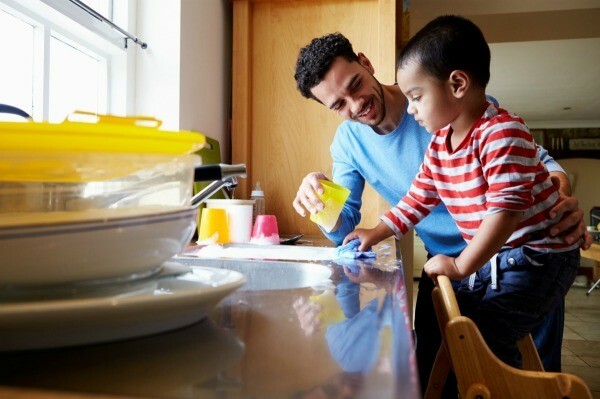 Teach a young boy that chores are not just for women. Something as simple as carrying out the trash helps a child learn that he has a contribution to making life easier for his parent, and eventually his wife. In small subtle ways teach a boy that it's not a "Woman Thing" to be thoughtful. Encourage him by suggesting, "It's so-and-so's birthday. Let's make them a card - or buy them a small present." Plant the seed and watch it grow. Last of all, when your son comes of age to have children, let him know that there is NOTHING wrong with being a good responsible Dad. Diaper changes and bottle feedings haven't killed a man yet. But an overworked, stressed out wife and mother, sure can make for a miserable marriage. Years ago, things were different, and I'm glad to say many men have changed their way of thinking and it seems the younger generation of men are more thoughtful than some were in the past. While your young sons are in their formative years, do your part, Moms. Your Daughter-in-law will thank you later! Excellent..I have emailed your comments to my daughter...she has my two grandsons: Walter, age 7 & Sam, age 5. This is absolutely true, and I speak as a relatively new daughter in law myself. It's much harder to housebreak a husband when he's grown than when he's still young! This was great! Times have changed but not nearly enough. I see far too many of my married female friends who have full time jobs and have to handle the childcare and housechores nearly single-handedly. It's just not fair! And I have two thoughtless brothers who have never once remembered my birthday....that's up to their wives. The only hope we women have is for mothers of male children to train 'em right in the first place. Having had a husband, boyfriends, brothers and a father who 'just didn't get it', we can only keep hoping that future generations of men will learn from their moms to act better and more responsibly.